We are based in Harrogate and usually work within North Yorkshire, but if the job is large we would consider working outside this area. All of our work is guaranteed, we have comprehensive insurance and our painters and decorators are fully qualified. We look forward to helping you. Please contact us for a quote today. 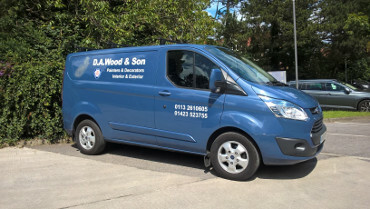 D A Wood & Son is a respected painter and decorator in Harrogate, North Yorkshire. We have been working in the painting and decorating trade for 30 years and take pride in the craftsmanship of our work and the quality of our service. Much of our work comes from "word of mouth". We are proud of this fact and we believe it is a testament to the quality of what we do and the friendliness of our tradesmen. If you have an urgent requirement for re-decoration or an exciting future project that requires some painting, we would be happy to discuss your requirements.